Learning about joints like Southern Soul BBQ is one of my favorite aspects of The "Q" Review. Southern Soul was started by a couple of BBQ lovin buddies on St. Simon Island, Georgia in 2006. With $700 and a smoker, Griffin Bufkin and Harrison Sapp opened a joint that became an instant favorite with the locals and gained national acclaim with appearances on The Food Network and TLC. Harrison runs the outdoor pits at Southern Soul, slow smoking everything with select hardwood. 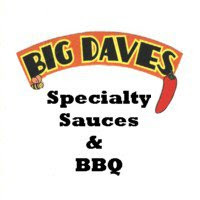 He uses the techniques he perfected in his own backyard to produce sweet and smokey pulled pork, ribs, brisket and poultry. In addition to the restaurant, Southern Soul also developed their own line of sauces. The guys from Southern Soul sent me all four of their signature small batch sauces. 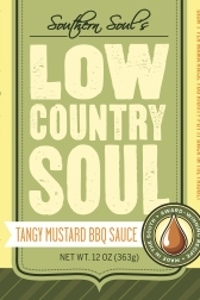 The first product I tested out was their Low Country Soul Tangy Mustard BBQ Sauce. Low Country Soul is a rich, bright yellow and speckled with coarsely ground black pepper. All Southern Soul sauces are packaged in 12 oz. glass bottles and slapped with their stylish labels. The sauces all have a great look, but Low Country Soul really stands out because of it's bold color. Using a "family recipe," Southern Soul jacks up yellow mustard with a brown sugar sweetness and a citrus / vinegar tang. They also added the previously mentioned black pepper for some savory spice. The result is tangy, Low Country sauce that can used as a burger condiment, BBQ sauce or dip. Anything that typically calls for mustard will benefit from the enhanced flavor of Low Country Soul. I used the sauce to finish a grilled pork loin. The texture is similar to other yellow mustards. It brushed on the pork easily. The sugars charred nicely creating a delicious crust. Later, I slice the loin and served a little extra Low Country Soul on the side for dipping. After watching the Triple D feature on their website and sampling Low Country Soul, Southern Soul has definitely hit my list of "must visit" BBQ joints. I can't wait to get down to Georgia for some wood smoked "Q". To learn more about Southern Soul, click here to visit their website. See how Low Country Soul rates on our "Product Reviews" page. 0 Response to "Southern Soul BBQ Low Country Soul"